Much to my astonishment, as of today — six days before the official publication date — "The Fuller Memorandum" is the #5 best-selling science fiction title on Amazon.co.uk. (And as #1-#4 include "1984", "Brave New World", and "The Handmaid's Tale" — three of the classic dystopias of the past century — it's actually the #2 current title.) ... correction: it's now at #2 in SF after "1984", and #84 in Fiction on amazon.co.uk. I don't normally work on book-length projects without a publishing contract up-front, but I probably won't surprise you if I say that I'm dealing with the lack of a project to work on post-"Rule 34" by working on, er, another Laundry piece. Excellent! I'm feeling a bout of stross-itis (symptom: irrestistable urge to buy books by charles stross) coming on. And another laundry work? Oh that's terrible (good) news . . .
"I'm dealing with the lack of a project to work on post-"Rule 34" by working on, er, another Laundry piece." I eagerly waiting for Amazon to ship both Wireless and the Fuller Memorandum. The prospect of a further Laundry story is good news to finish the week on. So have you thought of expanding palimpsest? The novelette reads like a modern abstract of the master's work (s/Pierce/Harlan), which left me yearning for more. I did just get an email from Amazon today saying it was going to be delivered earlier than they though too. Yes. In fact, writing the rest of the novel is my #1 idea for a far-future SF novel. Charles Stross "The Fuller Memorandum (Laundry 3)"
Will there be aliens too? IA didn't go there, but a left a nice hook. Congratulations for your position on the list! Congratulations! I've always thought the Laundry is your best work so far (and Merchant Princes the weakest). I'm waiting for my next Borderlands Books run to pick my copy up. My copy is pre-ordered. Another Laundry novel will be most welcome. Got my copy reserved at the VFLLS (Very Fine Local Library System) so far they only have one copy reserved for the whole county. Hopefully me and others will boost the numbers a little. According to Amazon UK they are now in stock - ordered today, got a delivery estimate of 30th June to 1st July. Turns on a penny, or like the fifth wheel of a taxi. I know I bought a copy, in hardcover. Which I never do. But if a greater $% to Herr Stross means more Laundry... I have tithed. Sorry, partly my fault. I accidentally pre-ordered TFM three times now, each time forgetting I'd done the previous. Until I got three "change of delivery time" emails today... Still, I've got people to pass them on to! I just found a pre-order link for "The Fuller Memorandum" in their Kindle format on Amazon's US store. iTunes iBookstore still shows nothing but I suspect it will soon follow there too. Just an FYI. Congrats and thank you for all your hard work! I love your Laundry books and hope you write many, many more - contract or not. I just pre-ordered from SFBC -- Charlie doesn't get as much, but I get to buy more books. They don't send until 7/6, but I'm reading a very long series now. 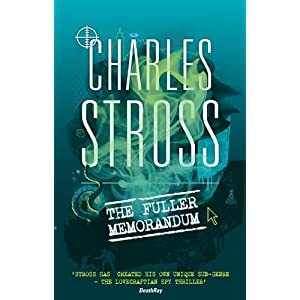 Not to be missed is Charles Stross' The Fuller Memorandum, the sequel to our omnibus, On Her Majesty's Occult Service. Check in on our hapless hero, Bob Howard, as he battles eldritch horrors and attempts to keep the seams of spacetime from being ripped wide open, as only he can...Stross has built quite a fun series here, and his writing chops are getting even sharper. Good. Congratulations. I look forward to my copy soon. As of 6pm in the UK, TFM is at #1 in science fiction on amazon.co.uk, at #40 in fiction, and at #79 in books. And it's not due out officially for another five days. US publication is still ten days out, but it's already at #54 in SF, and trending upwards. I've some Anthony Price on order ( certain I've read some of his stuff before , just want to be sure). Yes I know you haven't watched it for years - however Moffat seem s to like quirky and amusing stories, and the final tonight would I feel be enough to get your juices flowing in that direction. I have no desire to write a Dr Who script whatsoever. A big HELL YEAH on the more Laundry sooner business. That's a bit of a shame in many ways Charlie, as you'd be fantastic, but I can understand it just not being your thing. Just wondered if you had caught any of this series. There is ideas that are a bit more adult this series - one or two you might see as something you could play with in your own inimitiable style . um you can see I isn't a writer. Grammar and spelling like that ... oooh. Get your Laundry primary source documentation here. Hooray for an increasingly probable fourth Laundry novel! Charlie, is there any way to help out your book rankings without buying it online? I'm planning on patronizing my local, non-chain, bookstore. So nice to hear you're actually writing more Laundry already (although 'piece' is open enough that you could be doing a short - all good). The Laundry is one of the better pieces of mash-up fiction I've encountered. In a previous post you mentioned that after book four you thought you would probably drop the spy homage aspect. Please tread carefully here. Upon reading that bit of info, my first thought was that you would be making Bob Howard jump the shark after book four. Why by the time you get past book four the American T.V. series would be out and you'll be topping the best seller lists. Your writing time will be severely constrained - what with all the glitzy publisher parties and meetings with the wave of Hollywood sleazebags plying you with mounds of coke and hookers to get your name on their next Martin Lawrence vehicle so that they can get it smeared with the taste of nerd-cred. And by then, jumping the shark by breaking one of the foundations of the series would be the negligible. 'The Atrocity Archive' had a great resonance for me as I'm a big fan of Deighton. Your use of Deighton's tropes was note perfect. Ditto for Fleming. I haven't read the fellow you've used for TFM, but I can't imagine you'll miss your mark (I wouldn't mind reading him though if you would recommend some titles). So I hope you've got something up your sleeve as far as the stylistic and structural aspects of this beautiful mash-up series goes. I can't imagine you don't. I don't know about release dates, but amazon.co.uk just sent me a dispatch note for my copy. Charlie has already said no to George Smiley, but it may be difficult to avoid the echoing of the books. Le Carre doesn't show us Smiley's career as an active spy: he's always in a management role. Bob Howard is heading into that position, but the whole setting means that he won't be safely in an office, fighting a battle of wits. And besides, one could say the series already has a George Smiley. Bob doesn't need to go there. I've seen some of what he's working on, and it would tend to block off some of the approaches to the spy thriller. There's a whole range of gentleman adventurers, starting with Richard Hannay, and going on through Simon Templar, Bulldog Drummond, and others, in the aftermath of WW1, and flourishing in TV, both British and American, in the '60s and '70s. In some slight ways, the idea of the Laundry echoes Department 'S', but I don't think Bob Howard could be paralleled with Jason King. Angleton is sort of like the Steed of The New Avengers, and Bob might pass as a Mike Gambit, which gives us an obvious Purdey. But most of this stuff is so alike, so much a retread of some ur-itself, that once you do one story with the feature, you find you've done everything. OK, I think Charlie has picked one of the best as an inspiration. I think that sense of sameness in the genre is one of the reasons why The Prisoner made such a mark. It was done by people on the inside, knowing the tropes and perverting them. Is that what Charlie is doing? A double layer of that warping would be difficult, even if The Village is such a useful concept for the stories (and gets used as such). Sometimes, it's a question of whether the mood can be sustained for a novel. A great deal of the examples from TV are effectively short stories, and the plot device of the TV episode falls apart if you have the time to look at it closely. Which makes 4 of Charlie's in the "to read bookcase" or ordered; Ok, that seems like a plan for after the book I'm presently reading. I've already done "The Prisoner". Huh. For some reason, my pre-ordered copy has an estimated ship date of September 7 from amazon.com. Mine arrived this morning from Amazon.co.uk. Charlie; is there some issue with release dates over the Pond? My copy and that of my boss just showed up together with my copy of Ken Macleod's The Restoration Game. So the heroic fantasy project featuring the slaad is still not a goer, huh? I like essays, so ordered Wireless today, and because your Favicon is the Linux Tux and you're using a programmer's editor (something I advocate in the online copywriting world), went ahead and threw in a couple others. It's always interesting to stumble across a "new" writer (new to me), and nowadays, it seems as if a good blog makes the decision to try a couple titles much, much easier. As for not having an upcoming book contract, if you had any guts at all as a writer, you'd write a science fiction novel entirely in Haiku. Bleeding edge and all that. Haiku are hard, and I don't have a poetic bone in my body. How about multi-viewpoint second person present tense? Would that satisfy your jones for bleeding edge? If you're allergic to poetry, consider incorporating performance art into the making of your next book (or even something Christo-esque). This is illustrative of a larger problem with writers; they sit down at the keyboard, begin with the bloodletting, and think it's enough. C'mon. We live in a world where Paris Hilton thrives, so think bigger, more viral. Like draping yourself in pink satin fabric for the 9/12/18 months spent writing your next book. It can't help but drive sales. A decade from now, you'll look back on this moment and thank me. Looking forward to the YouTube video. Viral marketing and $0.50 will get you a nasty head-cold. I'd just like to say that this is the happiest thing I've read on the Internet today. Palimpset is my #1 favorite story that I've read this year*. When I read your comments in Wireless about the 500-page Expensive To Print threshold I thought "But..but...you could have fit 100 more pages of it and still had room to spare!". I found myself reading the last 3 or 4 pages very...very...slowly, because I simply did not want it to end. * - interestingly, my second-favorite thing I've read this year is Neal Asher's Orbus, which also features a slightly unusual narrative style, with the entire novel being written in the present tense. I think it works really well for science fiction. Just finished Fuller Memorandum (kindle version read on iPhone). Thanks for a wonderful experience! This page contains a single entry by Charlie Stross published on June 25, 2010 4:39 PM. That empty feeling was the previous entry in this blog. Gadget Patrol: iPad, a month on is the next entry in this blog.